Sgt. 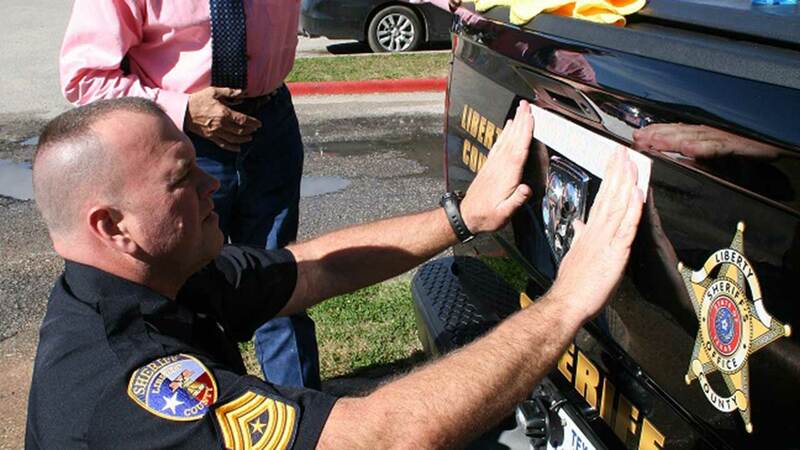 Brett Audilet places the first "In God We Trust" decal on a patrol unit. LIBERTY COUNTY, TX (KTRK) -- The Liberty County Sheriff's Office is putting faith on display. On Thursday, the first decals displaying the message, "In God We Trust" were placed on patrol units. The Liberty County Sheriff's Office says the idea of displaying the motto has been discussed over the past two years. "Right after the Childress Police Department put 'In God We Trust' decals on their patrol cars several of the office personnel, deputies and others began talking with me to see if we could do the same thing," said Sheriff Bobby Rader. Radar said once Texas Attorney General, Ken Paxton, agreed the wording was permissible on department vehicles, the Sheriff's Office had to figure out how to pay for the decals. "We did not have any money set aside in the budget for this expense and I did not think it would be right to spend the taxpayers hard earned tax money on a project like this," said Sheriff Rader. However, once word spread throughout Liberty County, the Sheriff said several private donors offered to pay for the project.